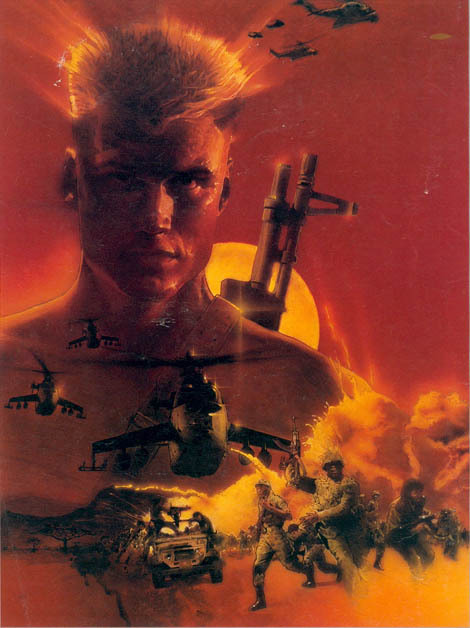 From listening Albert Pyun's audio commentary of his CYBORG director's cut, MASTERS 2 and SPIDER-MAN were in prep in December 1987 (soon after the Black Monday which put Cannon into trouble), so while MASTERS 1 was still barely opening in Europe, therefore they launched the sequel while they didn't have the total gross yet. What a lot of people also forget to mention is that after SPIDER-MAN and MASTERS 2 fell through, Pyun wrote the script of CYBORG from two other previous projects he had: his own remake of JOHNNY GUITAR designed with John Travolta in mind, and ALEX RAIN which was like an early version, precursor to NEMESIS with Kelly Lynch cast as the lead (she had just done the post-nuke flick OSA). 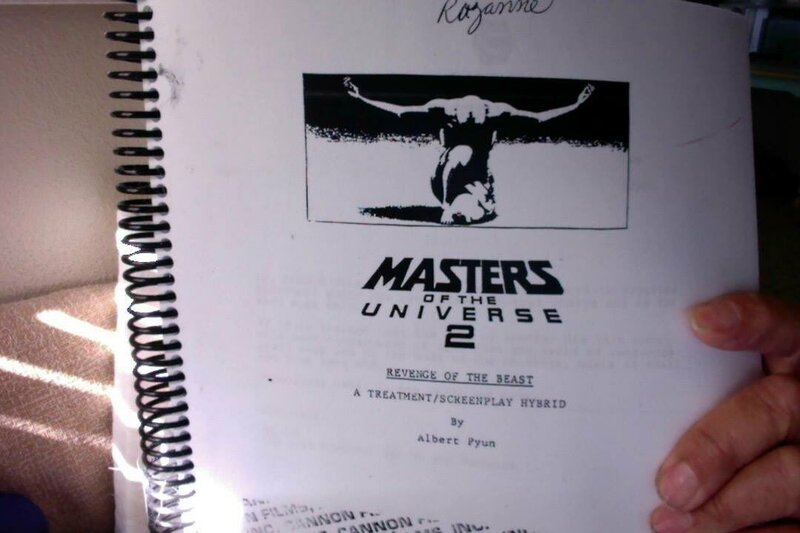 According to my interview with Stephen Tolkin, who wrote the MASTERS OF THE UNIVERSE 2 screenplay based on Albert Pyun's story, the people at the Mattel department they dealt with were so rude and obnoxious about their insane demands that even Golan and Globus no longer wanted to make the film, and the whole department allegedly got fired afterwards. What could we have expected from your Masters of the Universe 2 and Spiderman? Masters of the Universe 2 would not have been as pure fantasy as the first film. It would have been more like a graphic novel. It was much darker. Spiderman was going to be in the same vein. It was going to be more emotional in the sense that it was going to be a film about how to overcome loss, and like Masters of the Universe 2, it was about the responsibilties of having to try to live up to your ideals. I love the fact that after Masters of the Universe and Spiderman were cancelled, you re-used all the set and costume designs for Cyborg. What had happened was that we had spent a lot of money on the prep of those two films, but Cannon reached a point where they couldn't make rights payments to Mattel and Marvel. I felt it was criminal that we had spent all this money on two films that couldn't be made so I came up with the idea of ''Let's take what we've built and go make another movie, so we can at least get that money back. '' Golan and Globus really liked that idea! Yes, that's likely, ad Pyun is used to make profit of movies to make other movies he made Nemesis 5 on three days after making Adrenalin for the weinsteins). P.S : it's quite a coincidence, as I was browing Albert Pyun fb page yesterday. It's an awesome page, funny sometimes, and sad most of the times, as Albert is quite sick, but still fully passionate about filmmaking. This had to be taken with pinch of salt though, because MOTU 2 was supposed to be filmed after Pyun had shot the first part of SPIDER-MAN (so that the Peter Parker actor would have time muscle up). Both projects would have had more time (4-6 weeks) to film compared to the rest of Pyun's filmography (a few days up to 2 weeks). There's some new infos about MOTU 2 on the new CYBORG special edition by Shout / Scream Factory. This is interesting... I wonder how much of this was changed prior to the script being rewritten. 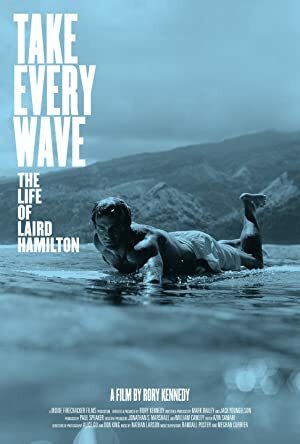 When I spoke with Gary Goddard, his understanding was that producers were planning on setting the film on earth once again (most likely to save production costs). This was one of the many reasons that made Goddard decide to part ways with the production, as he felt the earth setting had been done already. The sequel, in his eyes, needed to be set entirely on Eternia. From what I gathered from his other audio commentary, I think Pyun's plans for the sequel would have departed further from the MOTU line. Albert Pyun got an early draft of what he called a "treatment/screenplay hybrid" that attached editor Rozanne Zingale Oriella sent out to him. I thought Pyun was basically not fit to do anything anymore? I know he closed his Facebook page down a year or so ago because his dementia had gotten too bad. His health is not very good but the symptoms seem to come and go, and he's obviously a filmmaker who would rather die making a movie than doing nothing... That said it's shame many projets he's done in the past decade are either not released or unfinished.